My girls were formerly competitive swimmers. Modesty aside, they were in the top ten nationwide of their age group. Daughter #2 was in the Philippine team even. Daughter #4 broke an NCR record. Last weekend the team's former coach, Eric Buhain, invited all his former swimmers to a potluck reunion. It was a happy occasion. The food was overflowing. The stories unending. 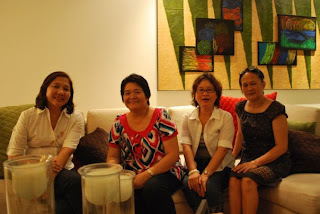 Eric's wife, Congresswoman Eileen Ermita Buhain also joined in the fun together with her three pretty daughters. Eric's new house left us in awe. It was zen-like in it's lines and simplicity. We ooohed and aaahed as were toured. There were walls that looked like plain walls but in reality were actually doors to the guest room and powder room. I noticed that the Danze faucet were used in most of the plumbing and sanitary installations. Oh and did I mention that there is a two-lane 20 meter pool in the premises? The swimmers actually wanted to stage a relay competition but since most did not bring swim suits, it was left for another day. 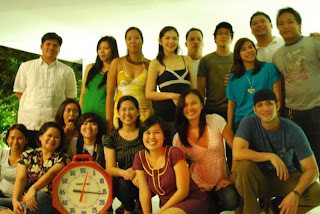 I organized the reunion and I am now tasked to organize one every 3-4 months. 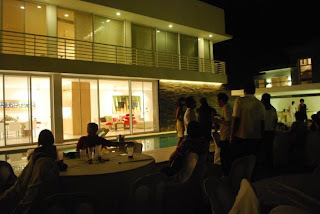 Next venue will be in Coach's house in Tagaytay. to make it around 11:30 P.M.
damn, makes me wanna learn how to swim. hehe! ate lena, at what age did your girls started swimming? @ eMz: sige, i'll ask one of the girls to teach you. @ wena: competitive swimming? d4 started competing at age 6.
pero if you're referring to "learn to swim" any age will do as long as the child is willing. ideal ang 6 yrs old because at this age they can follow instructions. Reunions are always something to look forward to...at least to some. Just like Emz, this almost makes me want to learn how to swim. I can float, does that count? That's the only thing I learned in my swimming class sa St Scho [ 2 sems of swimming yan ha]....and I passed...no idea how I passed that class though. good to know that your kids are as energetic and athletic as you! is nathan starting up?